Most boys don’t come potty trained (unless your son is a peeing prodigy), but you can teach them the art quickly and effectively – don’t worry, you no longer need to fear the possibility of sending him to his first school dance with Pullups underneath his tuxedo. The key is consistency (and rewards – LOTS of rewards). Most boys take to the toilet if you encourage them to set goals and aim high (but not too high – you don’t want them to miss the bowl completely). It’s a long-held belief (perpetuated by parents and pediatricians) that potty training boys take longer than girls. One reason for this is that women have historically been the ones who toilet train when little boys might be more receptive to their daddies. Another reason is that girls have a stronger desire for hygiene. This is a desire that appears to remain for quite some time: the average teenage girl is showered with hair and makeup carefully done; the average teenage boy mists on some body spray and smiles while flexing in the mirror. 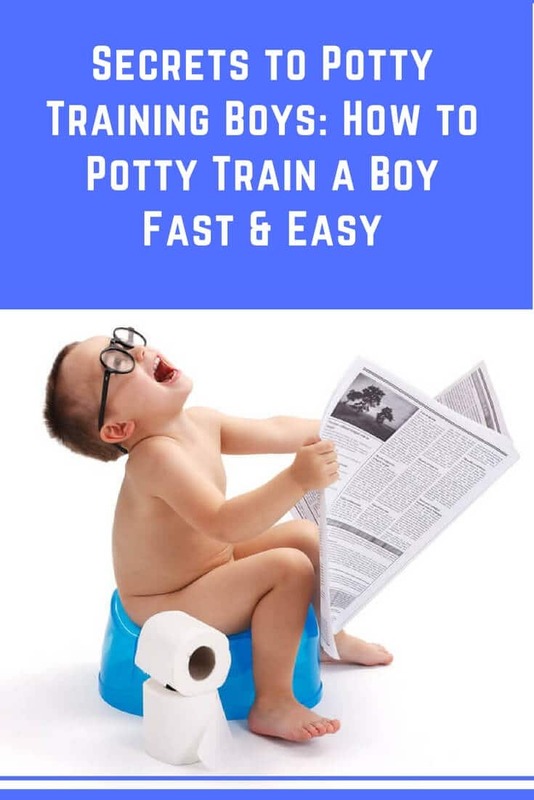 But, whatever the reason, boys can potty train if they want: they just need to learn to go like a girl. Like the Byrd’s song says, “To everything, turn turn. A time to poop in diapers, a time for the potty.” Okay, those aren’t the exact lyrics, but you get the point: timing matters and matters most. Potty training will never be successful until your son is truly ready. There is no perfect age (though most boys learn to use the potty between two to three years); instead, your son will show you he is ready through his actions. He might show interest in the toilet, have regular bowel movements, or go for long periods with a dry diaper. When he demonstrates any signs of readiness, it’s time to give it a shot. Just make sure you don’t begin during a transition period: when you’re moving into a new home or going on vacation, for instance. And, once you do begin, if he continues to have accident after accident, know that it’s possible you tried too early. You wouldn’t go into a football championship without a game plan and you shouldn’t enter this battle without one either. Set the tone beforehand by allowing him to watch an older role model (a brother or father) use the toilet, explain to him that everybody pees and poops and does it in the toilet, read him books on the topic, let him choose his own potty, and make sure you have easy to remove clothes available. Sweatpants good; zippers and buttons bad. Men, by nature, like to be comfortable on the toilet. That’s why they head there with the latest subscription of the New York Times, ready to set in for a long winter’s crap. Boys are no different: if something is uncomfortable for them, they won’t do it. Thus, cultivate comfort however you can. When sitting on the potty, make sure your child can lean forward with their feet on the ground (you’ll need to have a child-sized potty to make this happen). If you use an adapter seat, make sure it’s comfortable but also remember that a large toilet is much, much scarier than a small one. And be sure to have a stool so your son can keep his feet stable. You’ll also want to avoid a urine guard. Sure, you want one to protect your bathroom floor from a “mansoon,” but these guards can scape against the child and leave them associating the potty with pain. For children who are able to control their bowels, purchasing underwear with their favorite characters is an effective form of manipulation: they’ll gladly soil a regular old pair of briefs, but nary a piece of poop shall hit the face of Spiderman. Rewards are part of the potty training game too. Boys are particularly responsive to stickers – they like to collect them in binders or on jackets and show them off to their friends. Anything that instills pride in a child gives them motivation. Allow your son to sit down while peeing (and pooping, obviously). Sitting down gives him the opportunity to master the basics. Once he’s learned, encourage him to rise, stand tall, and pee like the wind (but not into it). However – be warned – allowing your son to urinate from a standing position before he’s ready is setting him up for accidents and you up for spending half your grocery budget on bottles of bleach. Once your son has peeing down, initiate target practice. This is best taught by the father as he has the correct equipment. Many people use props, like Cheerios or raisins, to give their child something to aim for. It doesn’t always work – at best, your son grows frustrated by his inability to hit the cereal; at worst, he fishes it out of the toilet because it’s snack time. Taking to the potty to pee but not to poop is a common occurrence. There are a few reasons for this. Your son may be afraid of sitting on the toilet (it’s not rare for kids to think they can fall in and get sucked into the plumbing). Your son could be used to standing and doing a poo and not understand the need to sit. Or your son could be dealing with constipation. Get to the root of the problem and then work to solve it. Don’t shout or lecture – that will only make things worse…..including your diaper bill. Children love to be in charge; if they had their way, sugar would be the only food group. A son who’s convinced using the toilet was his idea will grow more likely to use it again (and paint himself as brilliant in the process). If you’re expressive in your pride, your child will be more responsive. In order to become good at something, we must practice and that includes toilet training. But practicing every so often is not enough: consistency is key. And this consistency must come from you. Strive to be consistent in your positivity – cheer, congratulate, encourage. And refrain from switching things up: if you start with a child-size potty, keep using it. If you have them go to the toilet before nap time, make that a hard and fast rule. Whatever you’re doing, continue. Eventually it will stick. Set aside naked time: Naked time is exactly what it sounds like – let your kid run around sans clothing. Without the security of a diaper, your son learns quicker to control his bladder. Watch for visible signs: Most children exhibit signs when they need to use the bathroom – they jump or hold themselves. Keep an eye out for these clues (and an ear out for a more overt one (the sound of water dribbling onto the carpet)). If your son doesn’t take to the potty as you had hoped, don’t punish or shame. That is the quickest way to set the process back. If your child isn’t making progress, take a break – there’s always a chance you started before they were truly ready. If they’re still not taking to the toilet after you’ve tried and tried again, seek the help of a pediatrician. Learning to control your bladder as you sleep takes much longer than daytime diligence. This leaves some children in nighttime diapers well after they’ve conquered potty training during waking hours. Even so, there are hints that your child is ready to brave the bed without a barrier. First, wait until he uses the toilet during the day consistently. Then begin to check his diaper after naps and nights. Once it begins to stay dry repeatedly, you can give night without diapers a shot. There’ll be accidents, so prepare yourself: wetting the bed is common among children (fifteen percent of kids up to the age of five do it) and it’s possible it will require months or years before your child is fully incident-free. But try anyway, especially if your child wants to sleep without diapers. If they continue to have nighttime accidents, you can always go back to nighttime diapers (but be sure to take them off as soon as he wakes up or you’ll risk daytime regression). At the end of the day (or when you’re at the end of your rope), potty training happens eventually. Different kids learn proper etiquette at different times. The best you can do is go with the flow and wait for their flow to happen. Have you got the right tools to succeed in potty training?